This Special Skill is a distinctive trait of biomechanical or artificial soldiers operated via telepresence or an on-board pilot AI. There are several types of Ghost, but this Special Skill does not have numerical Levels. A Ghost is an intelligence, resident or foreign, organic or artificial, that takes hold of the machine and governs its actions. What exactly is the difference between a machine and a living being? This Special Skill is equivalent to G: Remote Presence, but additionally requires that the army field at least one trooper with G: Mnemonica, or Hacker, or a TAG, in order to field the user. Despite its lack of Cube, a trooper with the G: Autotool Special Skill may receive a G: Mnemonica trooper's WIP value, G: Mnemonica Special Skill and Lieutenant Special Skill (if applicable). The Autotool limited AI system was developed during the heyday of the Ur Civilization, and was modeled after Ruaria behavioral patterns. With this technology, the Ur created and mass-produced semi-autonomous tools of all kinds, revolutionizing a wide array of fields. Eventually, the EI updated the last version of the technology and repurposed it for auxiliary control of its tactical operative incarnations. Troopers with this Special Skill have several bodies available on the game table they can activate, jumping from one to another to always be in the thick of the action. The player must enlist either two or three Proxies available to a trooper with this Special Skill. All the Proxies of a G: Jumper trooper must be in the same Combat Group, where they are counted as only one trooper. This Special Skill allows its user to have several troopers called Proxies. A G: Jumper trooper provides a single Order no matter how many Proxies he has. This Special Skill allows G: Jumper troopers to deploy two or three Proxies, applying any Deployment Special Skills they might have (Airborne Deployment, Infiltration...). Players do not need to place the Active Proxy Marker in the Deployment Phase. During the Active Turn, the G: Jumper trooper can activate any of his Proxies by placing the Active Proxy Marker beside the Proxy he wants to activate when declaring the Order. The only Proxy that can perform the Order is the one with the Active Proxy Marker. During the Reactive Turn, the G: Jumper trooper can activate a Proxy by placing the Active Proxy Marker beside it if an enemy trooper declares an Order in LoF or ZoC. This allows the Proxy to declare an ARO normally. If an Order is declared in LoF or ZoC of several Proxies that belong to the same G: Jumper trooper, then his player can activate only one of them. Inactive Proxies can react in ARO to any Order declared in LoF or ZoC by declaring Change Facing, Dodge, or Reset, if possible. At the end of the Order in which a Proxy entered the Isolated state, or any Null state, the player can place the Active Proxy Marker beside any of the G: Jumper trooper's other Proxies which is not in Isolated state, or any Null state. A G: Jumper trooper cannot activate a Proxy in Isolated state, or any Null state, until such state is cancelled. If all the Proxies of a G: Jumper trooper are in Isolated state, or any Null state, then the G: Jumper will be considered a casualty until at least one of his Proxies recovers from such state. In the Deployment Phase or during the game (if the Proxies possess any Special Skill which allows them to deploy during the game), the player must deploy all the Proxies of a G: Jumper at the same time, as if they were a single trooper. The player must count separately each Proxy's Cost Attribute value of its Troop Profile. If the player has at least one AI Beacon that is not in Isolated state, or any Null state on the game table and all the Proxies of a G: Jumper trooper (no matter the Combat Group they belong to) enter a Null or Isolated state, then he can keep using the Order provided by the G: Jumper trooper. That Order will be added to the Order Pool of the AI Beacon's Combat Group. The Order of the G: Jumper will be available only while the player has in any Combat Group at least one AI Beacon which is not in Isolated state, or any Null state. So, if the AI Beacon enters in a Null or Isolated state, then the Order of the G: Jumper will be transferred automatically to any other AI Beacon from any Combat Group which is not in any of these states. The AI Beacon has no effect on Victory Points for the Proxies, which will count normally. If the G: Jumper trooper is the Lieutenant and all his Proxies enter the Isolated state, or any Null state, then that will result in a Loss of Lieutenant situation. This situation can be cancelled normally whether the player has an AI Beacon or not. Placing an Active Proxy Marker beside a Proxy that is in a Marker state (Camouflage, TO Camouflage, Impersonation, Holoecho...) doesn't reveal the Proxy, because it is the type of Order or Short Skill of the Order declared which cancels those states. The same happens with Hidden Deployment, activating the Proxy doesn't reveal the trooper. So, it is not required that the player place the Active Proxy Marker on the game table until the moment he spends the Order or ARO on the hidden trooper. When a player moves a G: Jumper trooper from one Combat Group to another, he will move all the Proxies, as they are considered to be a single trooper in each Combat Group. G: Jumper grants its user the G: Remote Presence Special Skill (see Infinity N3). The Posthuman Valentina Nero has 3 Proxies on the battlefield. A Proxy Mk.2 (infiltrated TO) armed with a MULTI Sniper Rifle, a Proxy Mk.3 (Heavy Infantry) with a Spitfire and a Proxy Mk.1 Hacker, placed in the Deployment Zone. Valentina decides to activate her infiltrated Proxy, placing the Active Proxy Marker beside it and declaring her Order: Move + BS Attack. The successful shots of her Sniper Proxy clear the path for her Heavy Infantry Proxy Mk.3 with Spitfire. So, she places the Active Proxy Marker beside it and declares her next Order: Move + Move, taking up a good firing position with the Heavy Infantry. That is the end of the ALEPH player's Active Turn, with the Active Proxy Marker beside the Heavy Infantry. Then, the Active Turn of her opponent begins. A Hellcat lands in the rearguard of the ALEPH player, in LoF of Valentina's Inactive Proxy Mk.1 Hacker, and in the ZoC of the Proxy Mk.3, which is the Active Proxy. Valentina has right to react with both Proxies, and decides to not jump into the Proxy Mk.1 Hacker, keeping the Proxy Mk.3 as the Active Proxy and declaring its ARO: Change Facing. With this ARO, the Hellcat will be in the LoF of the Proxy Mk.3. Moreover, the inactive Proxy Mk.1 Hacker declares a Dodge ARO, to gain Partial Cover against the threat of the Hellcat. Both Proxies succeed in their respective rolls. In the next Order, the Hellcat declares a Move + BS Attack Order, sharing the Burst between the Inactive Proxy Mk.1 Hacker and the Active Proxy Mk.3. Valentina declares a BS Attack ARO with the Active Proxy Mk.3, while the Inactive Proxy Mk.1 Hacker declares Dodge. The Active Proxy Mk.3 has to make a Face to Face BS Roll against the Hellcat. While the Inactive Proxy Mk.1 has to make a Face to Face PH vs BS Roll. However, the Proxy fails the Dodge and the ARM Roll, losing one Wounds Attribute point, but it is still in the game, thanks to the V: No Wound Incapacitation Special Skill. Let's suppose at the beginning of the Active Turn, the Hellcat landed in LoF of the Inactive Proxy Mk.1 Hacker, but out of LoF and ZoC of the Active Proxy Mk.3. Then, Valentina would only get an ARO with the Inactive Proxy Mk.1 Hacker. So the Posthuman decides to jump into it, places the Active Proxy Marker beside it, and declares a BS Attack ARO. The Hellcat now is threatened by the Normal BS Roll of the Active Proxy Mk.1 Hacker. Let's imagine now the Inactive Proxy Mk.1 had entered the Dead state due the BS Attack of the Hellcat, removing the model from the game table. In a normal situation, that would be the end of the Posthuman, but as she has the G: Jumper Special Skill, and two Proxies which are not in Null, or Isolated state, then she can place the Active Proxy Marker beside one of them and keep playing. But let's suppose now that Inactive Proxy Mk.1 in Dead state would be the Posthuman's last Proxy. In a normal situation, that would mean the loss of the Order in the Order Count phase of her next Active Turn. However, the player has one AI Beacon, keeping the Order provided by Valentina. During the Deployment Phase, Valentina Nero, our intrepid Posthuman, decides to start playing with her Proxy Mk.2 (infiltrated TO) which is in the Hidden Deployment state. This state doesn't require players to place the model on the game table, and it is not necessary to place the Active Proxy Marker on the game table. Those who possess Ghost: Jumper skills are entities, whether from artificial origin or not, whose consciousness inhabits the data net and can download themselves into different bodies called Proxies in order to interact with the physical world. The Posthumans related to ALEPH's Special Situations Section have at least two Proxies deployed on the battlefield in which they can download themselves and take part in the thrill of combat, being able to jump from one to another to always be in the thick of the action, or as a quick escape route. Troopers with this Special Skill have several bodies available on the game table they can activate, jumping from one to another to always be in the thick of the action. However, troopers possessing Ghost: Jumper Level Z can activate REMs that are in a Fireteam, improving their capabilities. During the Active Turn, every Remote of a Fireteam possessing an ACTIVE PROXY LZ Marker replaces the values of its CC, BS and WIP Attributes from its profile with the ones from the trooper with this Special Skill. However, during the Reactive Turn, only one of those Remotes will benefit from this Special Skill. Only those Remotes (REM) that are in a Fireteam and are in the same Combat Group as the trooper with this Special Skill can benefit from the ACTIVE PROXY LZ Marker. A trooper cannot benefit from a Supportware program and from this Special Skill at the same time. Each trooper with G: Jumper LZ can have a maximum of one ACTIVE PROXY LZ Marker on the table. This Special Skill allows the user to place an ACTIVE PROXY LZ Marker next to a Fireteam that is in the same Combat Group and contains Remotes (REM). The player will place the Marker next to the appropriate Team Leader Marker, during the Deployment Phase, when placing the G: Jumper LZ trooper on the table. In both Active Turn and in Reactive Turns, each time that the player activates a Remote (REM) that is in a Fireteam with an ACTIVE PROXY LZ Marker, that Remote replaces the values of its CC, BS and WIP Attributes from its Trooper Profile with the ones from the G: Jumper LZ trooper. Although, in the Reactive Turn, when an Order is declared within the LoF or ZoC of several Remotes in the same Fireteam, only one of them will benefit from the ACTIVE PROXY LZ Marker, chosen when declaring their ARO. All Remotes in a Fireteam with the ACTIVE PROXY LZ Marker also gain the Number 2 Special Skill. It is not compulsory that the Remote be the Team Leader of its Fireteam to benefit from the ACTIVE PROXY LZ Marker. Each time that a Remote in a Fireteam with the ACTIVE PROXY LZ Marker is activated by an Order or an ARO, the G: Jumper LZ Trooper will also be activated, and will be considered to have declared Idle. The player must remove the ACTIVE PROXY LZ Marker from the table at the end of the Order in which the G: Jumper LZ trooper enters Isolated or any Null state. The player must remove the ACTIVE PROXY LZ Marker from the table when the Fireteam is cancelled. The player may place the ACTIVE PROXY LZ Marker on the table again, by expending one Entire Order, with no Roll required. The Marker will be placed next to a Remote that is in a Fireteam in the same Combat Group that the G: Jumper LZ trooper is in. The effects of the ACTIVE PROXY LZ Marker will be applied in subsequent Orders/AROs. If the player has at least one AI Beacon in that is not in Isolated state or any Null state on the game table, and the G: Jumper LZ Trooper (no matter the Combat Group they belong to) enters a Null or Isolated state, then the player can keep using the Order provided by the G: Jumper LZ trooper. That Order will be added to the Order Pool of the AI Beacon's Combat Group. The Order of the G: Jumper LZ trooper will be available only while the player has in any Combat Groups at least one AI Beacon that is not in Isolated state, or any Null state. So, if the AI Beacon enters a Null or Isolated state, the Order of the G: Jumper LZ trooper will be transferred automatically to any other AI Beacon from any Combat Group which is not in any of these states. The AI Beacon has no effect on Victory Points for the G: Jumper LZ trooper, which will count normally. G: Jumper LZ grants its user the G: Remote Presence Special Skill (see Infinity N3). During her Active Turn, an ALEPH OperationS Sectorial Army player with an Apsara, a G: Jumper LZ trooper, and a Fireteam: Core of Dakini Tacbots with a ACTIVE PROXY LZ Marker spends an Order to make their Team Leader declare BS Attack. Due to the ACTIVE PROXY LZ Marker, this Remote replaces its CC, BS and WIP Attributes with the Apsara's ones, so the BS 13 of this trooper is applied. In the next Order, the Team Leader declares Reset, so every member of the Fireteam: Core also declares Reset. The Dakini Tacbots are Remotes (REM), so, since their Fireteam has the ACTIVE PROXY LZ Marker, all of them replace their CC, BS and WIP Attributes with the Apsara's ones. So, all the Dakini Tacbots of the Fireteam: Core apply the WIP 13 of this G: Jumper LZ trooper. During her Reactive Turn, an ALEPH OperationS Sectorial Army player declares AROs against the declaration of an Order within the LoF of the Remotes of her Fireteam: Core with the ACTIVE PROXY LZ Marker. Since the AROs are due to one Order, only one of the Remotes will be able to replace its CC, BS and WIP Attributes with the Apsara´s ones. During the Active Turn of the ALEPH OperationS Sectorial Army, her Fireteam: Core of Dakini Tacbots is cancelled due to loss of members. Spending her last Order, the player places the ACTIVE PROXY LZ Marker on the table again, next to the Haris Leader (F: HARIS LEADER) Marker of a Special Fireteam: Haris consisting in a Yadu, a Samekh FTO and a Rudras GunBot. During the next Reactive Turn, against an Order declared within the LoF or ZoC of the members of that Fireteam: Haris, they'll be able to declare AROs. Although, since they are in their Reactive Turn, only one of the Remotesthe Samekh FTO or the Rudras Gunbotwill be able to replace its CC, BS and WIP Attributes with the Apsara's ones. For the Aspects of ALEPH and for the Posthumans, having different bodies or even jumping from one body to another is something essential in their own nature. So doing the same with a Remote was an obvious step, although not particularly desirable for the Posthumans, accustomed to more sophisticated options. Despite the manifest tactical benefits, this technology was initially developed for support work during rescues and emergency situations. In a disaster area, industrial or service Remotes may be found, maybe because the authorities have them available or just because they are there, forgotten. Usually, these kinds of civil Remotes have the physical endurance and capabilities to be able to accomplish dangerous tasks but lack the decision-making capacity and agility necessary for delicate operations with human lives at stake. In these situations, G: Jumper covers those deficiencies. Troopers with this Special Skill do not have their own Orders, but instead are activated by the same Order as their Controller, who is the trooper that appears in the same Unit Profile. Troopers possessing G: Marionette are activated in teams called Troupes, that behave like a Fireteam: Core, replicating the actions declared by their Controller, who is defenseless while controlling them. The player must place up to three PuppetBots, known as a Troupe, with their Controller. All the members of a Troupe and their Controller must be in the same Combat Group where they count as only one trooper. G: Marionette troopers don't contribute Orders to the Order Pool, and cannot receive Orders from their Order Pool. However, these troopers are always activated by the same Order as their Controller. In order to act, both the Controller and the G: Marionette troopers must declare the same Order, declaring the same Short Skills of the Order. But, the Order declared by the Controller is always considered an Idle, taking no action. The members of a Troupe will apply the rules for a Fireteam: Core of two or three members, depending on their number. To do so, a Troupe is identified by the Troupe Leader Marker (TROUPE LEADER), equivalent to the Team Leader from the Fireteam rules. The Controller doesn't belong to the Troupe and won't be taken into consideration when applying the Fireteam rules. When the number of members of a Troupe is reduced to one, that trooper will keep being activated by its Controller's Order. The Controller and the G: Marionette troopers grant a single ARO to each enemy trooper in LoF or ZoC. In the Reactive Turn, all the Troupe members and their Controller have their own ARO to any Order declared in their LoF or ZoC. However, G: Marionette troopers will apply the rules for Fireteams when declaring that ARO, while any ARO declared by their Controller will be considered an Idle. If the Controller enters or is in the Isolated or any Null state, then the G: Marionette troopers will enter the Disconnected state at the end of the Order that happened. If a G: Marionette trooper enters or is in the Isolated or any Null state, they will enter the Disconnected state at the end of the Order that happened. If a G: Marionette trooper stops being part of the Troupe, they will enter the Disconnected state at the end of the Order in which that happened. The number of members of a Troupe is reduced to one: that trooper will keep being activated by its Controller's Order. The Troupe is cancelled: then the Troupe Leader (and only the Leader) will keep being activated by its Controller's Order. There is no limit to the operative distance between the Controller and the G: Marionette troopers. The Controller may be activated in the regular manner only when he or she is deployed without G: Marionette troopers, or whenever all of them are in any Null or Isolated state. G: Marionette troopers possessing the Airborne Deployment (AD) Special Skill will be deployed with the same Order their Controller uses to deploy. In such situation they must be deployed at the same time and on the same table edge segment, or within the same Circular Template. The presence of a Troupe of G: Marionette troopers doesn't count towards the player's limit of a single Fireteam: Core on the game table. G: Marionette troopers also have the G: Remote Presence Special Skill (Infinity N3), and the Number 2 Special Skill (Human Sphere N3). Usually, in order that the G: Marionette troopers may act, their Controller must declare an Order without getting to execute it, staying still in a safe place on the battlefield. Meanwhile the G: Marionette troopers are the ones who are executing the Order. In the Deployment Phase or during the game (if they have any Special Skill that allows them to deploy during the game), G: Marionette troopers will be deployed at the same time as their Controller, as if they were a single trooper. It is not necessary to include a Hacker or TAG in the Army List to be able to enlist Remotes (REM) possessing G: Marionette. G: Marionette troopers and their Controller cannot be part of a Coordinated Order nor be a member of any type of Fireteam, unless specified otherwise. When a player moves the Controller from one Combat Group to another, he will also move all G: Marionette troopers that are assigned to them, as they are considered to be a single trooper in each Combat Group. G: Marionette troopers cannot benefit from any Supportware program. A genuine Tunguskan product, the units with G: Marionette are the creation of underground hackers-toymakers, who use them as elements for remote operation. However, even with the undeniable technical capacities of these hackers-toymakers, the Marionette system is inferior to the Ghost: Jumper systems used by ALEPH. The weak point of this technology is the state of deep immersion demanded of the Controller, whose consciousness is projected into her remote units, leaving her own body defenseless. In order to activate this Special Skill, the user must be in a Null state. The user may transfer his own WIP Attribute, along with the Ghost: Mnemonica Special Skill and the Lieutenant Special Skill (if applicable), to any other trooper in the same army that is on the battlefield in the form of a figure or Marker and has a Cube. The new WIP replaces the host's original value. If the G: Mnemonica trooper was also the army's Lieutenant, the host becomes the new Lieutenant. Once activated, this transfer is automatic at the end of the Order in which the user entered in Null state. You must identify the figure or Marker that acts as host, but not whether the Lieutenant Special Skill is transferred—that is Private Information—. After the transfer is complete, the original user, now in Dead state, is removed from play. If the host enters in a Null state, the original user's WIP, G: Mnemonica and Lieutenant Special Skill may be transferred again to another ally who fulfills the same requirements (Cube...).This transfer makes the host enters in Dead state. G: Mnemonica also grants its user the Valor: Courage Special Skill. Troopers with G: Mnemonica do not have a Cube. Mnemonica is a capability displayed only by EI Aspects, further proof of the terrible sophistication of VoodooTech. It allows the Aspect to jump onto an allied vessel's Cube upon destruction of its physical form (a Charontid, an Anathematic, a fearsome Avatar...), overriding the host's control over his own body so that the EI may continue to lead the charge, whatever the cost in soldier's lives. G: Remote Presence grants its user the Valor: Courage Special Skill. Troopers with G: Remote Presence do not have a Cube. Troopers with G: Remote Presence and an STR Attribute have two distinct levels of Unconsciousness. In game terms, when a trooper with G: Remote Presence loses all STR points, it enters the Unconscious state like any other trooper would. However, if the trooper receives damage again and loses one further STR point, it does not enter the Dead state as usual, but instead enters a second level of the Unconscious state signified by a second Unconscious Marker (UNCONSCIOUS). Only if the user loses further STR points does it fall Dead and is removed from play. Troopers with G: Remote Presence need only an Engineer in base to base contact to pass a single WIP Roll in order to recover from either level of Unconsciousness and revert back to STR 1. Additionally, when using Engineer (or other Special Skills or piece of Equipment that state so explicitly) to repair a trooper with G: Remote Presence, you may expend one Command Token to reroll a failed WIP Roll. Remote Presence technology is a characteristic trait of unmanned TAGs and Remotes. Remotes are controlled by a pseudo-AI and a suite of expert programs that govern their combat behavior with precision and fearless logic. TAGs, on the other hand, benefit from the autonomy of a human pilot, but Remote Presence technology allows these pilots, miles away from the battlefield, to focus on performance instead of safety. This Special Skill allows a Doctor or an Engineer to operate or repair remotely through the Skill's user. Only troopers possessing the Doctor (any Level) or Engineer Special Skills can enlist G: Servant troopers in their Army List. The player must identify which trooper each G: Servant trooper is linked to during deployment. They cannot be used by any other trooper. The user of this Special Skill and its Doctor/Engineer must be in the same Combat Group, where both of them count as only one trooper. G: Servant troopers don't provide Orders to the Order Pool, and cannot receive Orders from their Order Pool. However, they are always activated by the same Order as their Doctor (any Level) or Engineer. If either trooper is not able to perform one of either Short Skills of the Order, then that trooper will perform only the Short Skill he is able to perform, and the other Short Skill will be an Idle. While the other trooper will perform his complete Order normally. The Doctor/Engineer and the G: Servant trooper grant a single ARO to each enemy trooper in LoF or ZoC. So, each enemy trooper will be able to declare a single ARO against either trooper that is in their LoF or ZoC. In the Reactive Turn, the Doctor/Engineer and the G: Servant trooper have their own ARO to any Order declared in their LoF or ZoC. However, the declared ARO must be the same for all of them. Close Combat. In the Active or Reactive Turn, if only the Doctor/Engineer or the G: Servant trooper is engaged with an adversary then, applying the previous Effects, only that trooper will perform the CC Roll, or the correspondent Roll, while the other trooper will perform an Idle. However, even in the Active or Reactive Turn, if the Doctor/Engineer and the G: Servant trooper are engaged with the same adversary, then only one of them will perform the CC Roll, getting a MOD of +1 to his B and +1 to the PH Attribute for Damage thanks to the other. Other friendly troopers engaged in that CC, who are not the Doctor/Engineer or the G: Servant trooper don't provide any bonus. In ARO, the adversary can only target one of them. There is no limit to the operative distance between the Doctor/Engineer and the G: Servant trooper. If the Doctor/Engineer enters the Isolated state, or any Null state, then the G: Servant trooper will enter the Disconnected state at the end of the Order that happened. If the Doctor/Engineer is, or becomes, Impetuous or Extreme Impetuous, then his Impetuous Order also activates compulsorily the G: Servant trooper, which will be considered Impetuous or Extreme Impetuous as well. A Doctor/Engineer can have more than one G: Servant troopers, but he can only activate them one at a time, applying all the previous conditions. Meanwhile, the other G: Servant troopers will be inactive. G: Servant troopers possessing the Airborne Deployment (AD) Special Skill will be deployed with the same Order their Doctor/Engineer uses to deploy. In such situation, they must be deployed at the same time and on the same table edge segment, or the same Circular Template. G: Servant grants its user the G: Remote Presence Special Skill (see Infinity N3). G: Servant troopers will be deployed at the same time their Doctor/Engineer is deployed as if they were a single trooper. It is not necessary to include a Hacker or TAG in the Army List to be able to enlist Remotes (REM) possessing G: Servant. Thanks to this Special Skill, a trooper with G: Servant can cancel the Unconscious state of another trooper, recover STR points, and perform all the capabilities of the Doctor and Engineer Special Skills, even though they lack them. However, when using this Special Skill, it will be the Doctor/Engineer who makes the corresponding Roll. Players cannot apply the Doctor/Engineer Special Skills to different targets in the same Order. The Doctor/Engineer Special Skills can only be applied to one target per Order. The G: Servant trooper must meet all respective requirements to use the Doctor/Engineer Special Skills remotely. Usually, to allow the G: Servant trooper to reach the target, the Doctor/Engineer declares the Order, but doesn't perform it (which is considered an Idle), standing still in a safe place of the battlefield. Meanwhile, the G: Servant trooper performs the Order, moving until it reaches base to base contact with the target. A G: Servant trooper and its Doctor/Engineer cannot be part of a Coordinated Order nor be a member of any type of Fireteam, unless specified otherwise. When a player moves a Doctor/Engineer from one Combat Group to another, he will also move any of his other G: Servant troopers, as they are considered to be a single trooper in each Combat Group. The Mech-Engineer Yie Yang declares the first Short Skill of the Order, Move. She moves towards a Total Cover area while the little Yáozăo, her G: Servant Remote, moves towards a Gūjiă in an Unconscious state, downed in the middle of the battlefield. A PanOceanian Fusilier with LoF to the Yáozăo declares a BS Attack ARO against it. Yie Yang then declares the second Short Skill of the Order, Dodge. The Yáozăo must perform a Face to Face Roll, but not Yie Yang, as she is not being threatened, so players consider this to be an Idle. The valiant Yáozăo wins the roll, dodging the enemy shot. Yie Yang spends a new Order, declaring Move as the first Short Skill of the Order. She moves until she reaches base contact with the Total Cover, while and the Yáozăo runs towards the Gūjiă. There is no ARO against them, so Yie Yang declares Move again as the second Short Skill of the Order. She stands still behind the Total Cover and the Yáozăo moves up to its target. The next Order is to Move + Engineer, with the Yáozăo reaching the fallen TAG while Yie Yang remains safe behind Total Cover, from where she performs the WIP Roll to repair by tele-presence through her reliable Yáozăo, recovering one point of the STR Attribute of the fallen Gūjiă. The effectiveness of medical assistance troops can be severely hindered by the difficulty and high level of risk that approaching fallen comrades through a crossfire implies. To minimize the risks and increase the odds of success, remote technologies have been developed, installed in highly mobile robotic platforms that can cross the battlefield and perform emergency interventions with higher efficacy and safety for themselves and their patients. The user of this Special Skill does not have its own Order, but instead is activated by the same Order of its Controller, the trooper who has the G:Synchronized trooper as a BS Weapon option. A G: Synchronized trooper replicates the Orders performed by its Controller. The user of this Special Skill and its Controller, known as a Synchronized Unit, must be in the same Combat Group, where both of them count as only one trooper. The user of this Special Skill must keep Coherency with its Controller. G: Synchronized troopers don't provide Orders to the Order Pool, and cannot receive Orders from their Order Pool. However, they are always activated by the same Order as their Controller. The Controller and the G: Synchronized trooper grant a single ARO to each enemy trooper in LoF or ZoC. On the Reactive Turn, the Controller and the G: Synchronized trooper have their own ARO to any Order declared in their LoF or ZoC. However, the declared ARO must be the same for all of them. If the Controller has more than one G: Synchronized trooper, then this Special Skill works in the same way. In this situation, the Controller and all his G: Synchronized troopers are activated with the same Order. Close Combat. 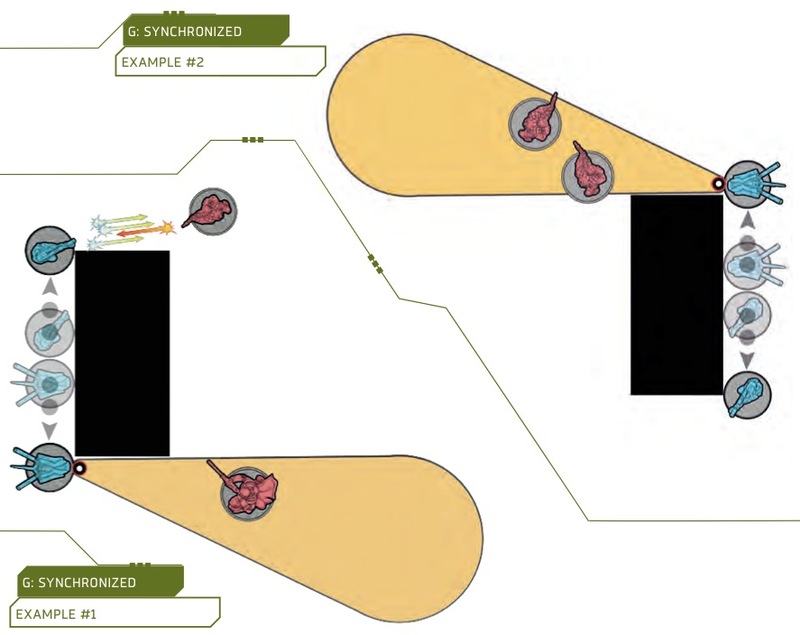 In the Active or Reactive Turn, if only one member of the Synchronized Unit, being the Controller or the G: Synchronized trooper, is engaged with an adversary then, applying the previous Effects, only that member will perform the CC Roll, or the correspondent Roll, while the other member will perform an Idle. However, in the Active or Reactive Turn, if more than one member of the Synchronized Unit is engaged with the same adversary, then only one of them will perform the CC Roll, getting a MOD of +1 to his B and +1 to the PH Attribute for Damage for each additional member of the Synchronized Unit engaged in the CC. If the members of the Synchronized Unit are engaged in separate CCs, it works in the same way: only one member in each CC will perform the CC Roll, or the correspondent Roll, getting a MOD of +1 to his B and +1 to the PH Attribute for Damage for each additional member of the Synchronized Unit engaged in that CC. Any member not engaged in CC will perform an Idle. Other friendly troopers engaged in that CC, who are not members of the Synchronized Unit don't provide any bonus. Coherency. In the Deployment Phase, the player can perform a Deployment Phase Coherency Check after having deployed a Synchronized Unit. In the Active or Reactive Turn, when activating the Synchronized Unit with an Order or ARO, the player must perform an Initial Coherency Check. In the Active or Reactive Turn, when finishing an Order or ARO, the player must perform a Final Coherency Check. If the G: Synchronized trooper fails a Coherency Check, breaking Coherency with its Controller, then it will enter the Disconnected state immediately but before measuring movement, if he has declared any. If the Controller enters the Isolated, or any Null state, then the G: Synchronized trooper will enter the Disconnected state at the end of the Order that happened. If the Controller is, or becomes, Impetuous or Extreme Impetuous, then his Impetuous Order also activates the G: Synchronized trooper, which will be considered Impetuous or Extreme Impetuous as well. G: Synchronized troopers possessing the Airborne Deployment (AD) Special Skill will be deployed with the same Order their Controller uses to deploy. In this situation, they must be deployed at the same time and on the same table edge segment, or the same Circular Template. G: Synchronized grants its user the G: Remote Presence Special Skill (see Infinity N3). G: Synchronized troopers will be deployed at the same time their Controller is deployed as if they were a single trooper. It is not necessary to include Hacker or TAG in the Army List to be able to enlist Remotes (REM) possessing G: Synchronized. A G: Synchronized trooper and its Controller cannot be part of a Coordinated Order nor be a member of any type of Fireteam, unless specified otherwise. When a player moves the Controller of a Synchronized Unit from one Combat Group to another, he will also move all other members of the Synchronized Unit, as they are considered to be a single trooper in each Combat Group. If the player activates any Hacking Program which provides any MOD or state to the Controller of a G: Synchronized trooper (Cybermask, or Kaleidoscope, for example), then such MOD or state will also be applied to the G: Sychronized trooper. In the Active Turn, the Auxilia Calvin, with his back against the exterior wall of a small building, sends his Auxbot, affectionately named "Hobbes", towards one of the building's corners while he moves towards the opposite corner. So, the first Short Skill of the Order is declared (Move) activating both figures. Then, an Initial Coherency Check is made and both models move in different directions. When arriving at the end of his movement, Calvin sees an enemy Alguacil who declares a BS Attack ARO against him. Meanwhile, "Hobbes" when arriving at the corner faces a Grenzer who reacts declaring a BS Attack ARO as well. With the second Short Skill, Calvin declares he will perform a BS Attack, shooting the complete Burst (B) of his Combi Rifle at the Alguacil, and "Hobbes" declares a BS Attack with its Heavy Flamethrower, placing the Large Teardrop Template over the unfortunate Grenzer (see Graphic). Next, a Final Coherency Check is made to verify that Hobbes is still inside Calvin's ZC. Spending a single Order from the Order Reserve, Calvin and his Auxbot have attacked two different enemies. Let's see what could happen if the situation was different. The Auxilia Calvin, with his back against the exterior wall of a small building, sends his little Auxbot "Hobbes" towards one of the building's corners while he goes towards the opposite corner. So, the first Short Skill of the Order is declared (Move) activating both figures, who move in different directions. When arriving at the end of his movement, Calvin doesn't see any enemies. Meanwhile, "Hobbes" when arriving at the corner faces two Alguaciles who both declare a BS Attack ARO against the Remote. With the second Short Skill, "Hobbes" declares a BS Attack with its Heavy Flamethrower, placing the Large Teardrop Template over the two Alguaciles. Meanwhile, Calvin declares he will perform a BS Attack too. Although he has no target in LoF, it's required that he declares a BS attack to allow "Hobbes" to perform its BS Attack (see Graphic). In the Active Turn, the Auxilia Calvin and his Auxbot Hobbes engage in CC with an Alguacil. Both Auxilia and Auxbot declare a CC Attack, choosing Calvin to perform the CC Attack. The Alguacil declares a CC Attack ARO, targeting Calvin. A Face to Face Roll is made where Calvin gets a MOD of +1 to his B and +1 to the PH Attribute for Damage thanks to his Auxbot. In the Reactive Turn, the Auxilia Calvin is engaged in CC with an Alguacil, without his Auxbot Hobbes. The Alguacil declares a CC Attack, targeting the Auxilia. Both Auxilia and Auxbot declare a CC Attack, but only Calvin performs the CC Attack, as the Auxbot is not engaged in CC with any enemy, and its ARO is considered as Idle. The constant link capabilities of an operator and a synchronized unit allows a tactical understanding between both elements that provides superior control over the operations zone. The operator receives data through the synchronized unit's sensors, and the unit responds automatically to any order that the operator transmits via wireless signals, data link, or pheromonic connection. Q: How are troopers with G: Servant and G: Synchronized counted for Dominating Zones of Operations, Killing and Victory Points? A: Troops with G: Servant have their own cost in points and that is the value that is used to count Victory Points, Killing or points for Dominate a Zone. In the case of troops with a G: Synchronized or G: Servant trooper included in their unit entry, break down the points cost for each trooper. For example, an Auxilia and its Auxbot cost 14 points, but the breakdown of points indicates that the Auxbot costs 4 points, which are part of the 14 points of the Synchronized Unit, so the Auxilia costs 10 points. So, if both are in the same area to be controlled, the Synchronized Unit would add 14 points (not 18) and if they are in different areas you would have to count 4 points in one area for the Auxbot and 10 points (14-4) by the Auxilia in the other area. It works in the same way for calculating Victory Points and Killing. Q: Can I use G: Servant to cancel Immobilized state from his linked Engineer? A: No. As the G: Servant trooper doesn’t have the Engineer Skill it is the G: Servant’s Controller who is performing the Engineer Skill, and this cannot be done while in Immobilized state. Q: How do V: Dogged and G: Remote Presence interact with each other? A: When a trooper that has both skills enters the Unconscious state for first time, the player controlling it has to choose which to use. If the player chooses to activate V: Dogged, the trooper will ignore the effects of the Unconscious state and enter the Dogged state. That means that the trooper will enter the Dead state at the end of the Turn, or if the trooper suffers a new wound before the Turn ends. If the player chooses to use G: Remote Presence, the trooper will suffer the effects of the Unconscious state, but will gain a second Unconscious level before entering the Dead state and it could be repaired meanwhile. Q: If a trooper with G: Remote Presence and V: Dogged enters the second level of Unconsciousness, can he use Dogged? A: Yes, because V: Dogged can activate when the trooper entered the Unconscious state. Q: Is it the same procedure with V: No Wound Incapacitation? A: Yes, because the activation is the same as V: Dogged. Q: Does a trooper with the G: Servant Special Skill provide the bonus of +1 to Burst in CC to friendly troopers in the same combat? A: Yes, but only if they have not been activated by Order or ARO. Q: When all the Proxies of a G: Jumper trooper are in a Null or Isolate state and the player has an AI Beacon, if the AI Beacon changes ownership via an enemy Minesweeper, does the enemy add one or two Orders to their Ordel Pool? A: One. If the original owner recovers ownership of the AI Beacon, it will be add two Orders to the Order Pool, one for the AI Beacon and one for the G. Jumper. This page was last modified on 17 April 2019, at 11:27. This page has been accessed 236,602 times.